Top (L to R): Corn Soup, Heirloom Tomato Panzanella, Kale "Caesar" Salad. Middle: Green Beans with Bacon, Blue Cheese, Pecans and Dried Cranberries; Blackberry-Cucumber Salad with Fennel Pollen; Roasted Parsnip-Quinoa Salad with Shallot-Lemon Dressing. Bottom: Roasted Beet and Carrot Salad, Watermelon-Pepperoni Salad, Creamy Andalusian Gazpacho. This week, I’m looking back at my favorite dishes I made over the past year. These are the dishes I will probably make again (some I already have). I don’t spend a lot of time making appetizers, apart from those I prepared for my holiday entertaining week in early December. My favorite from that week was the Crostini with Smoked Blue Cheese, Caramelized Onion and Rosemary, which packed a potent amount of flavor in each bite-size serving. As for side dishes, Thanksgiving was a celebration of many good sides, the best of which were these Green Beans with Bacon, Blue Cheese, Pecans and Dried Cranberries. The Creamy Andalusian Gazpacho got attention from America’s Test Kitchen’s Feed site as a Twitter Fan Photo of the Week, which was a nice honor. Doesn’t hurt that the cold Spanish soup was really quite delicious. So was the Apple-Fennel Soup with Beans and Sausage, which I was inspired to make after reading an interview with the West End Bistro’s new chef, Devin Bozkaya. My favorite soup though was this Corn Soup, which I was inspired to make after having a hit-the-spot bowl at Bouchon Café. Kale was one of the biggest food trends of 2012. It was everywhere: salads, snacks and sides whether it was roasted, braised or raw. It’s no surprise then that the Kale “Caesar” Salad I wrote about in January, was on of Cook In / Dine Out’s most popular recipes this year. Adapted from a GQ recipe, it’s a bold take on the kale salad craze. As the seasons changed, I was inspired by available produce, producing salads like the Blackberry Cucumber Salad, which featured fennel pollen I picked up during my last visit to Eataly, and the Roasted Beet and Carrot Salad, probably the most visually appealing salad I made this year, which was inspired by the work of Bryan Voltaggio, chef of Volt. I don’t know why I threw together watermelon and pepperoni, but they were great together in Watermelon-Pepperoni Salad. For a Thanksgiving side, I came up with the seasonally appropriate Roasted Parsnip and Quinoa Salad with Lemon-Shallot Vinaigrette. My personal favorite salad was the Heirloom Tomato Panzanella, which I’ve been making for years pretty much every Sunday evening while tomatoes are in season from about mid July to mid September. It’s one of Chris and my favorite dishes. 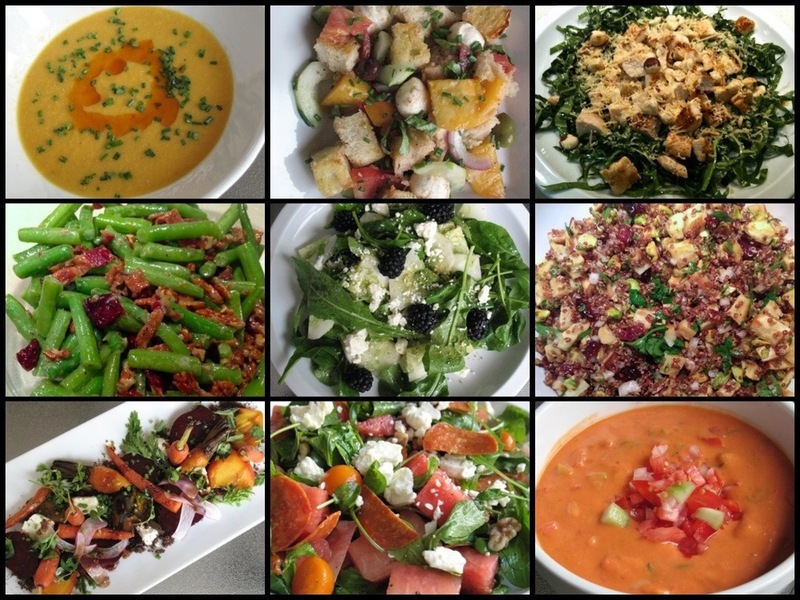 What a great year for salads, soups and sides! I love the panzanella, but that roasted beet salad was really something special. The corn soup was amazing too.